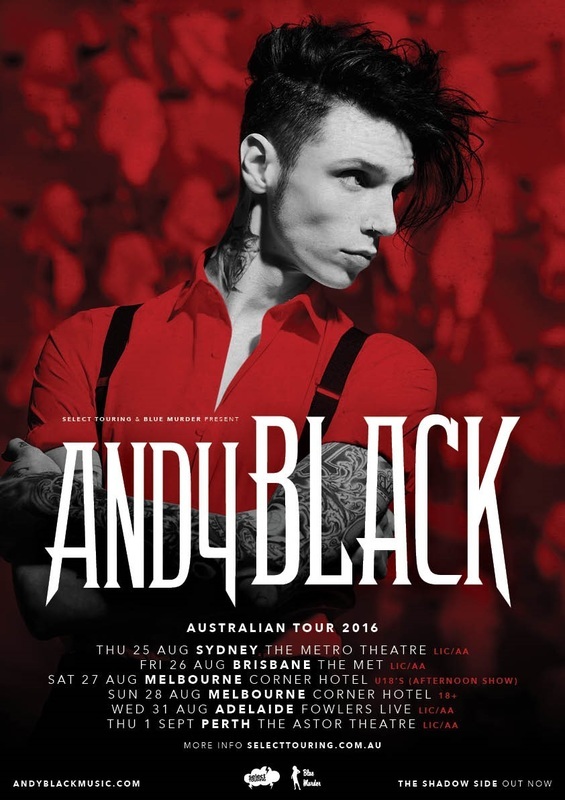 ​Andy Black, AKA Andy Biersack, frontman and founding member of Black Veil Brides, is heading down under this August and September for his first-ever solo headline tour. After gaining the world’s attention nearly seven years ago with the emergence of heavy rock band Black Veil Brides, who quickly created a buzz and has built one of the most passionate and formidable fan bases the world over. 2016 sees Andy Black step out as a solo artist with the release of his highly anticipated debut album The Shadow Side. Cinematic in scope, ambitious in concept, yet down-to-earth in execution, the album carves a brash new place for a bold new singer, using all the tools of pop craftsmanship and lush arrangements available. Songs like We Don’t Have to Dance, Put the Gun Down, and Homecoming King are readymade anthems embodying all that it means to be young, to be an outsider, to champion oneself and one’s loved ones with a vulnerable but unashamed urgency. Australian fans are yet to witness Andy Black in his solo element, but they won’t have to wait much longer! Bringing with him his full band and a long list of stellar tunes, fans will hear the likes of We Don’t Have to Dance, Ribcage and Stay Alive, along with several other tracks that are yet to be performed live. Australian fans are in for a real treat! Andy Black’s debut album The Shadow Side is out Friday 6th May.